A good method of Cost accounting helps to identify possible inefficiencies and areas of necessary improvement. A few years ago, a Boston based non-profit healthcare organization 'Partners In Health', worked in the health care system in Haiti and submitted a report on "Building Surgical Systems in Haiti". The report highlights that the 2010 earthquake resulted in thousands of donors, philanthropists, and international organizations coming to Haiti to offer services. For months they worked to save lives and ease suffering. What they did not do, however, was to contribute to strengthening Haiti's public health system while the main challenge to improve this sector was nothing but to getting doctors and care giver's commitment and involvement into the essence of the system. By Dr. Gérard Alphonse Férère, Professor Emeritus, Saint Joseph's University. As part of his vulgar and spurious statements against Haiti and her citizens, Donald Trump allegedly declared that "all Haitians have AIDS". Such erroneous statement would illustrate the level of his paroxysmal lack of information about that proud and loving people. Hereafter, a clear historical and scientific discussion of what I call "The truth about the introduction of AIDS from the U.S. to Haiti". It was in 1981 that two occurrences of the disease were formally confirmed in the continental United States, but it is believed that these were not necessarily the first. Soon after, in 1982, a most incorrect and unfortunate decision by the American medical authorities was made, when rushing to judgment, they indiscriminately included all Haitians among their so-called "high risk groups", together with homosexual men and I.V. drug users. In that regard, positions were taken and official statements made in very irresponsible manners by people who should have known better. As a consequence of their ignorance, their lack of sensitivity and their unscientific behavior, a whole nation was stigmatized. And still remains maligned, as proven by Donald Trump's alleged accusation. A new research that just came out would confirms that it is no longer a death sentence for Haitians living with HIV/AIDS. According to a research published in The New England Journal of Medicine, ten years after a free treatment program was introduced in Haiti for people infected with the HIV/AIDS virus, close to two third of the patients enrolled in the treatment were still alive. Out of 910 patients recruted at a Port-au-prince clinic, between 63 percent and 71 percent of them had survived 10 years. The occasion of the 1st of December was considered a day for hope, commonality and commitment between all Haitians in the fight against HIV and AIDS. This was the sentiment of the First Lady, Sophia Martelly as she addressed the crowd of supporters gathered at the World AIDS Day celebration in ST. Therese Park, Pétion-Ville. 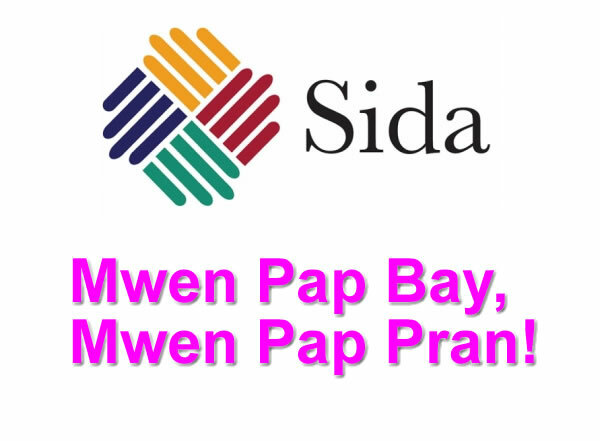 With the theme 'Sida, mwen pap pran, mwen pap bay', the celebration welcomed the presence of Mrs. Martelly, along with other notables such as representatives from various multilateral organizations, U.S. Ambassador in Haiti, Pamela White, Minister of Public Health and Population, Dr. Florence D. Guillaume, and the Minister of Youth, Sports and Civic Action, Magalie Racine. The Haitian Ministry of Public Health and Population (MSPP) is pleased to announce HIV positive test results among Haitians have fallen significantly, from almost 10% in 2004 to 3.67%, in a recently released report. During the same period, HIV/AIDS tests taken by the population have increased more than ten-fold, from 58,500 to 839,000. Pregnant women getting HIV tested have also increased nearly ten-fold, from 221,220 to 235,000. Treatment numbers for HIV/ AIDS have also risen dramatically within the past year, with an unprecedented 44% increase in 2013. The treatment rate for the past decade has shown, on average, 20% increase annually, the exception 2010, when the earthquake jolted the island.